Ocean trampoline, spa services, multiple pools and dining options and a welcoming beach setting sweeten a stay at the non-smoking Dreams Sands Cancun Resort & Spa. The high-rise Dreams resort furnishes 438 rooms with free Wi-Fi, iPod docks, satellite TV, stocked minibars and luxury toiletries. Pamper yourself over spa services or chill out on the private beach. The relaxing perks continue with two outdoor pools, three hot tubs and a sauna. Six restaurants and five bars make up the in-house dining choices. Around-the-clock options are also available. Fun times include billiards, evening entertainment and ocean trampoline. The hotel also offers a fitness center, water sports and Spanish lessons. Free on-site parking is available. The Dreams resort welcomes guests in a beachside setting less than nine miles east of central Cancun. A 12-mile journey north leads to the Punta Sam ferry terminal, offering trips to Isla Mujeres. Golf lovers are a 16-mile drive of the Playa Mujeres Golf Club. Cancun International Airport is within 15 miles of the resort. 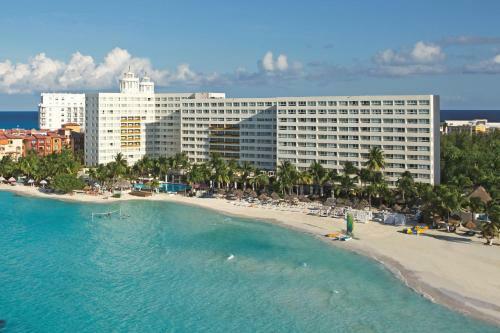 Dreams Sands Cancun Resort & Spa is an amazing Cancún lodging choice for your trip to Mexico. With numerous amenities for guests such as room service, 24 hour front desk, restaurant, you will wake up at Dreams Sands Cancun Resort & Spa feeling refreshed every day for your time in Cancún. Don’t let this amazing reservation opportunity pass you by, book your stay at Dreams Sands Cancun Resort & Spa today to make the most of your time in Cancún, Mexico.